My little boy just loves Robin Hood. I mean the Disney version, of course. At 2 1/2, I don’t think he’s quite ready for the live action versions of the story. (I have both the Errol Flynn and Kevin Costner versions on DVD) But the one where Robin is a fox, Little John is a bear and Prince John is a lion, that one is right up his alley. I’m not exactly sure what it is about this movie that has such a hold on his fancy. He used to be all in to Winnie the Pooh, but from the first day I let him watch Robin Hood it has been his favorite. He’ll watch others things, but will request Robin Hood at every opportunity. At first it seemed to be one of Disney’s lesser efforts with animation that was geared more toward Saturday morning cartoons than for a feature film. But now that I’ve seen the movie about 157 times and counting, I have developed a special appreciation for it. The movie has a lot of the stock Disney vocal talents for that time including Phil Harris as Little John (he was also the voice of Balu the Bear in “Jungle Book” and Thomas O’Malley in “The Aristocats”); Pat Buttram as the Sheriff of Nottingham (he was Napoleon in “The Aristocats”; Luke in “The Rescuers”; and Chief in “The Fox and the Hound”) and Carole Shelley as Lady Cluck (she was the goose in the pink bonnet in “The Aristocats” and one of the Fates in “Hercules”). Other notable voice talents include Andy Devine as Friar Tuck (recognizable because he had bit roles in just about every Western movie ever made) and country singer Roger Miller as the Rooster/Alan-a-Dale. Roger Miller also contributed most of the songs for the film. But for my money, Peter Ustinov steals the show as the voice of Prince John, the vain, scheming, vindictive, cowardly, thumb-sucking lion who has it out for Robin Hood. One of the reasons I can make it through multiple viewings of the film without my head exploding is because he gives such an enjoyable and over-the-top performance. I’m sure the reason my son likes the film is because it has all these animals running around doing funny and exciting things in a non-threatening way. 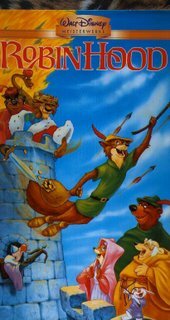 But the Robin Hood story itself has an appeal that goes much deeper for everyone old enough to understand the political dynamics of the time. When I was in college, a friend gave me a collectible action figure of Kevin Costner as Robin Hood in recognition of my then developing leftist political beliefs. Robbing the rich to feed the poor is the penultimate statement of leftist economic thought. A forced redistribution of wealth to right the wrongs of the oppressive capitalist overlords. 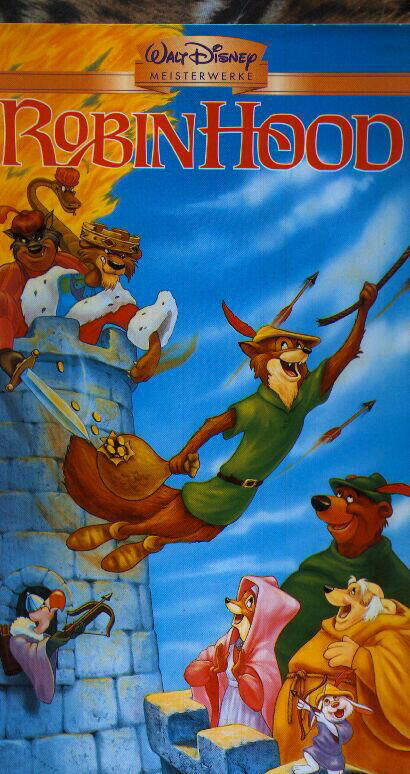 But Robin Hood also has many traits that appeal to conservatives such as his loyalty to the crown and his devotion to his childhood sweetheart Maid Marian. And then there is the fact that the thing he is objecting to the most is the high taxation being imposed by the despicable Prince John. My son will eventually outgrow his obsession with this particular movie, but hopefully he will retain a certain amount of pleasure in the timeless story that inspired it. In the comments to the Bono post, Mark Harden takes exception to the implication in Bono’s speech that the U.S. is not being generous enough with its foreign aid to developing countries. Here is a website with a lot of good information on that very topic. What we find out from the site is that the U.S. does indeed lead the world in foreign aid assistance when looking at total dollars given. Here is a list of the developed countries and the amount the dollar amount (in millions) that they donate towards ODA (Official Development Assistance). But when you take that same list and look at the donations as a percentage of each country’s Gross National Income (GNI), the U.S. suddenly winds up near the bottom. So you could argue the point two ways. Yes, we donate more than any other country. But it is not that much when taken as a percentage of our GNI. It’s like comparing a watermelon with a bunch of grapes. We could give more, but choose not to. So are we really being all that generous? Or let’s put it another way, who is more generous? A person who makes $10,000 a year and gives $100 to charity. Or a person who makes $100,000,000 a year and gives $1,000? Mark insists that the U.S. more than makes up for the paucity of its government assistance through private donations, but I have not seen a citation for this yet. He is welcome to add any links he finds in the comments. Too many Ralph Reeds ; Not enough John Danforths. Bono shows once again why he was tapped by Time Magazine to be Man of the Year. Remember when just one U.S. serviceman killed in Iraq was big news? Now when we have five soldiers killed in one day it only merits an inside story combined with an update on the Hussein trial. I nearly fell asleep last night trying to watch Bush’s State of the Union speech. While the speech itself was not terribly inspiring, reaction to it has been less muted here in the local blogosphere. Cernig was distracted by Bush’s Columbo-like eyebrow that “hovered and moved around, halfway up his brow as if it had a life of it's own. Libertas was annoyed with the president’s overuse of the term “freedom,” which is near and dear to his heart. Over at the E-N’s new political blog, Strange Bedfellows, Gary Martin takes notice of the oddly intimate embrace of President Bush and his favorite Democratic Congressman Henry Cuellar upon the president’s entrance into the House chambers right before his big speech. But it is Cincinnatus who finds and posts the picture. My take on the president’s speech is that when times are bad and his poll numbers are low he tends to jettison the red meat typically tossed out for his core constituency of rabid right-wing radicals and instead begins to sound like a moderate Republican or even a Democrat. Just look at Bush’s energy proposal. Denouncing our addiction to oil? That sounded like it was ripped right out of the pages of Al Gore’s “Earth in the Balance.” And not one word about ANWR. Likewise, most of the foreign policy parts of the speech could have been voiced by John Kerry while the health care proposals sounded like they could have come from Hillary Clinton. But don’t expect anything to come from these proposals. This is an administration that is just treading water, struggling to keep from sinking any further as the Abramoff scandal, the Iraqi quagmire and mounting deficits continue to weigh it down. As an aside, I thought the arrest of Cindy Sheehan for wearing an anti-war t-shirt to the event was a sad spectacle and a testament to our nation’s current state of paranoia and intolerance. As if to show that the sword cuts both ways, the security folks also bounced Republican Congressman Bill Young’s wife from the gallery for wearing a t-shirt that promoted the war effort. Provided that they sat quietly in the chamber, both women should have been allowed to stay and wear their respective shirts. That doesn’t leave any room for local stories, and most dailies insist on having at least one local story out front. It was fortunate for them that nothing big happened in Iraq yesterday. So what is a poor news editor to do? I was curious to see what the Express-News would do. They went with a 5-story front with the SOTU story on top, a King feature anchored in the middle and the Enron and Iran stories running down the sides. They also decided to cram in a local feature story in the upper left column just for good measure. The Academy Award nominees got the top of the page banner teasing the story in the Life section while they also found room to squeeze in a tease below the SOTU story on the Alito confirmation. Greenspan and the Feds were relegated to the Business section with no tease. All in all not a bad set of choices. Juan Cole has a list of the Top 10 things Bush won’t tell you in the State of the Union address. Also, I highly recommend anyone with a sense of humor to check out this spoof of Bush giving the 2006 State of the Union. Be sure and pay attention to the two guys in the background playing VP Cheney and Speaker Hastert. Hilarious. Here is the list of Academy Award nominees. Having not seen any of them, I’m not in a position to judge, but based on my perception of which films I would like to see given the choice I think the field this year is pretty lousy. Like I said before, I will probably never see Brokeback Mountain, not because of the gay theme, but because I don’t like movies about people cheating on their spouses and breaking up families. It is all too depressing. Nor do I have any desire to see Crash. I’m curious about Capote because of the excellent reviews Philip Seymour Hoffman has recieved for his performance, but it did not strike me as a best picture contender. I probably will see Spielberg’s Munich at some point and I want to see Goodnight and Good Luck, which I will cheer on to win the Oscar even though I think Brokeback is going to sweep everything. Personally, I think 100 years from now people will look back and say this was the year that Peter Jackson directed his version of King Kong, while all the other films will be long forgotten. Quick! Which film won the Oscar in 1977? You know! The year that Star Wars came out! (At least Star Wars got a Best Picture nod that year). Underscoring the importance of Disney’s purchase of Pixar Entertainment is the shutout of Disney’s first attempt at digital animation “Chicken Little” in the animation category. With no Pixar feature out last year, there were no digital films even nominated this year. The nominees were the hand-drawn "Howl's Moving Castle," and the stop-motion films "Tim Burton's Corpse Bride" and "Wallace & Gromit in The Curse of the Were-Rabbit." 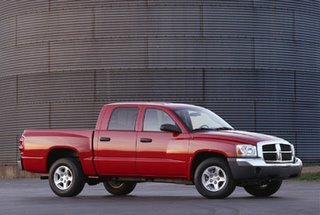 I just bought a new truck this weekend. Not this one in particular, but it is a red Dodge Dakota quad cab.